Remember the 1980’s when Martha Stewart was queen of all things domestic? I sheepishly admit to being young, impressionable, and eager to emulate the perfect holiday table – even if it meant buying a whole new set of dishes. Fast-forward to being older, hopefully wiser, free of any illusions that I will ever be Martha Stewart — and wondering why that was ever my goal. Oh, and embarrassed that one of the most useful tools in my studio has her name on it. I suppose the saving grace is that the tool isn’t pink or purple — why do companies think that women need their tools to be pink or purple?! This nifty tool found its way into my studio when I was teaching a book arts class for photographers. One of my students, Donnasue, showed me her Scor-Pal and I was hooked. I was in the middle of making an edition of The Heaven Project which is a post-bound book and I was scoring a lot of pages at 1.25 inches – a lot of pages! At the time I was using a quilt ruler – another favorite tool – but once I saw the Scor-Pal I had to have one. Before I had the chance to order my own, I was trolling Michael’s with my 40% off coupon and happened upon the Martha Stewart version, the Scoring Board. And, while not thrilled that it was Martha Stewart brand, I was glad to get the board at 40% off since I was “just trying it.” I took the board to class the following week and we compared. 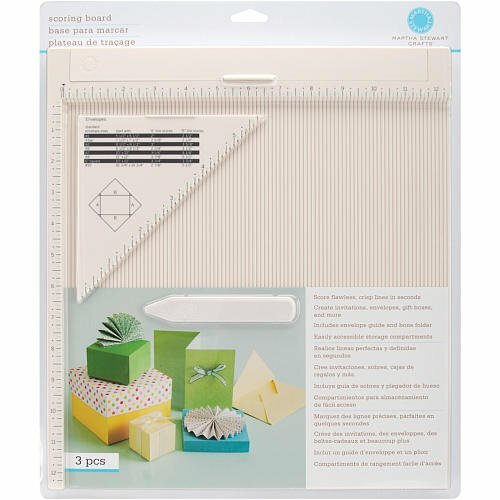 Another advantage of the Martha Stewart board is the scoring tool itself – it is narrower and leaves a sharper crease (yet does not tear paper) than the tool with the Scor-Pal. Unfortunately neither board has grooves that really accept a standard bone folder so it is necessary to swap tools while working. The third advantage is that the Martha Stewart board is available in local stores – stores which usually have coupons – so not only do you not have to pay shipping, you can usually get the tool at 40-50% off. I started to write a more in-depth review of both tools and came across a blog, Crafting with Sue, which has a great comparison of the two tools so if you want a more detailed analysis – Check it out. I’ve been using my Scoring Board for almost two years now. I use it daily and for every possible variation of book arts structure. It saves me time and gives my books a crisp, consistent fold and makes measuring a breeze. Do you have a favorite scoring tool? Another tool you’re embarrassed to admit to other artists? And why do they make tools for women pink or purple? This entry was posted in Art, Artists' Books, Handmade Books and tagged book making tools, Ginger Burrell, Martha Stewart, scoring board, www.gingerburrell.com. Bookmark the permalink. Ginger, This looks like a pretty sweet tool. There are occasions I need to make a series of scores at 1/8″ intervals and this looks like it would make short (and tidy) work of it! Yes, I have a scoring tool, though as I live in Europe it’s not the Martha Stewart brand and the groove spacing is metric. Yes, I use it on a daily basis. And yes, it is a peculiarly disgusting shade of mauve! Another tool I wouldn’t be without is a Japanese screw-punch, brass with a turned wooden handle, beautifully made. Makes neat little holes in a range of sizes from 1 to 3mm. well folks I also got MS score pad and love it, and love the light pink color!and yes MS score pal if much better than the first one I got because of more measurements and thinner scorer thingy. I recently discovered this tool at a binding class taught by a professional binder and maker of artists books. We can’t knock a good tool, so I completely get it! I hope your book(s) turned out just as you’d envisioned. Thanks for sharing this post! Bless you for this, Ginger. I remember having seen this pink-shaded Martha Stewart item quite a while back at a store and sneering. But then, just about the time I saw this post, I started working on an edition of round books needing tedious scoring. As soon as I saw this, I knew this was the answer! And it was! Is! It has made things so much easier. Even a jig wouldn’t have worked as well. The 1/8″ was exactly what I needed. I’ve discovered that it will also score with a small embossing (ball tip) tool as well as my regular bone folder (which I custom shaped for a thinner scoring edge), but the attached plastic thingy that comes with it does seem to give the crispest score. At any rate, thanks for the tip!